The first online casino opened in 1994 to enable gamers to enjoy their favourite games in an online atmosphere of fun and excitement. Since those early years tens of millions of players throughout the world have found that playing online offers them the most convenient gambling atmosphere with the highest payouts and the greatest number of game options. 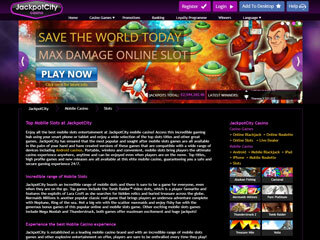 One of the most popular online casino sites is the JackpotCity Casino. JackpotCity brings the thrills of casino entertainment to any PC or mobile device to offer players a gambling event that fits their personal expectations. Regardless of whether you love the traditional casino games or prefer your competition to involve high-speed slot machines and fast, spin-and-win win lottery and variety games, you’ll find everything in one convenient site at the Jackpot City Casino. When you open the slots lobby you’ll find three-reel classic slot machines that are perfect for beginning players plus plenty of five-reel video slots for gamers who have more experience and skill. If you are looking for interactive action with free spins rounds,multiple paylines Gamble Games, respins, expanding reels and wild symbols you’ll enjoy spending time playing the Jackpot City Slots. 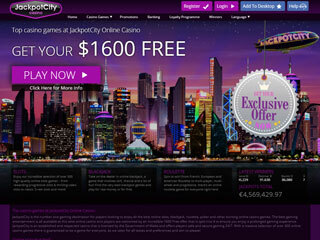 Jackpot City’s slots are powered by Microgaming and include different themes and storylines. There are underwater adventures such as Mermaid’s Millions, whimsical slot machines that include So Much Sushi and So Much Candy, vacation-themed slots of Summer Holiday and Summertime and pokies with travel themes, plots of suspense and intrigue, animal-themed slots and much more. The casino also presents a large selection of card games and classic casino table games with features that include blackjack, craps and poker along with fun-filled variety games and lotteries such as keno, scratch card, bingo and sic bo. For poker enthusiasts there are single hand classic poker and multi-hand interactive poker variations. Roulette players have their choice of American Roulette, Premier Roulette, French Roulette, European Roulette and Roulette Royale. There are low-stakes games for pennies a spin and high stakes games in which you can compete for highly-rewarding payouts. Games are offered for free in the Free Mode and as well as for Real Money Prizes in the Real Mode. JackpotCity offers top casino bonuses. If you play at a land-based casino you’ll collect your bonuses in the form of hotel discounts and restaurant vouchers. When you play online at Jackpot city you will collect your bonus points, cash, points and free spins in the form of real money gifts! All of these JackpotCity promotional bonuses allow you to play more games for more time for free. Simultaneously, you’ll be collecting your wins as real cash payouts! You’re first week of casino entertainment will be met with 1600 in free gaming credits for your sign up bonus. You can collect these credits when you make your first deposit. The Welcome Bonus is divided up into match credits for your first four bets. On your first deposit the casino matches your deposit with a 100% match up to $400, leaving you with $800 with which to play. On your second deposit the casino matches your deposit with a 100% match of up to $200 so you have an additional $400 with which to play. On each of the next two deposits the casino will match deposits with a 100% match of up to $100 that gives you another $400. All in all you’ll have $1600 for your opening gaming event. In addition JackpotCity Online Casino offers daily, weekly and monthly promotions of cash, casino credits and free spins. You can also win cool gadgets, 5-star cruises and vacation packages. JackpotCity Casino utilizes the most advanced 128-encryption codes and the latest firewalls to guarantee that you will enjoy top security with protected passwords and usernames. The casino is powered by the Industry giant Microgaming whose casino software makes it easy and user-friendly to play on any gaming device – both desktop and mobile. Gamers can conduct their casino banking transactions safely in their preferred currency. The casino supports a wide range of ebanking institutions such as evoucher and ewallet programs, credit and debit cards, echecks and ebanks that facilitate transfers of funds through wire or direct bank transfers. All of these banking options are encrypted to ensure the highest level of security. The Jackpot City customer service line is open 24/7. You can get help with any questions relating to the casino’s games, banking transaction options or technology. The customer service representative can also help you link your casino account to your personal ebanking account. 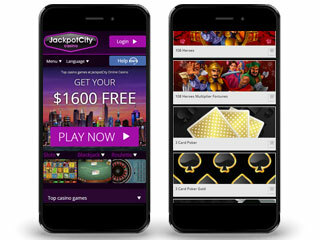 The JackpotCity Casino offers a unique gambling experience that gives players an option that they can use to play their favorite games on any PC or mobile gaming device.